Under the Fatimids, Egypt becomes the leading centre of Islamic civilization. 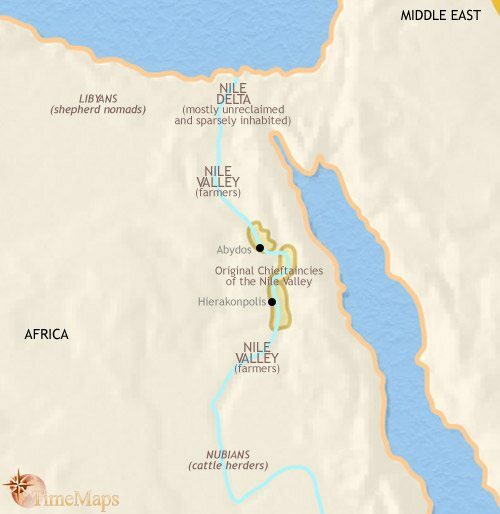 Ancient Egypt, one of the great civilizations of world history, is taking shape in the Nile Valley. The civilization of Ancient Egypt is entering one of the most glorious periods of its history. After centuries of greatness, the civilization of Ancient Egypt has now entered a long period of decline. Its ancient glories now in the past, Egypt is now just another province within the Persian empire. Egypt is now ruled by monarchs descended from one of Alexander the Great's generals. Egyptian independence has come to an end with the death of its famous queen, Cleopatra. 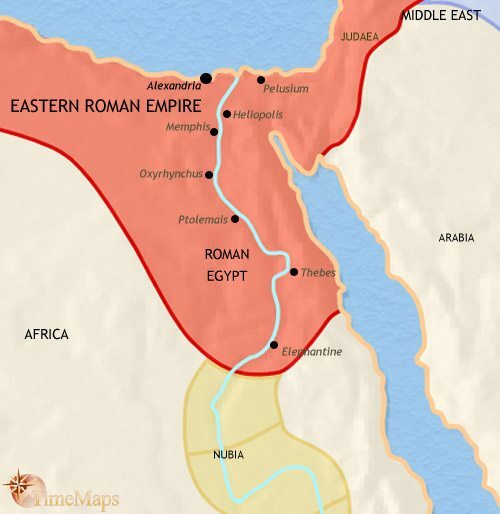 Egypt is a province of the Roman empire. 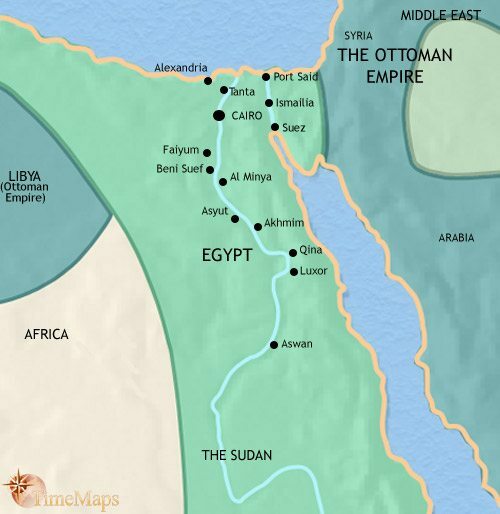 Egypt is a province of the Eastern Roman Empire. Egypt has become a province of the Islamic Caliphate. Egypt is now under the dynasty of the renowned Muslim leader, Saladin. Egypt is now ruled by a class of slave-soldiers, the Mamluqs. Egypt is now a part of the Ottoman empire. 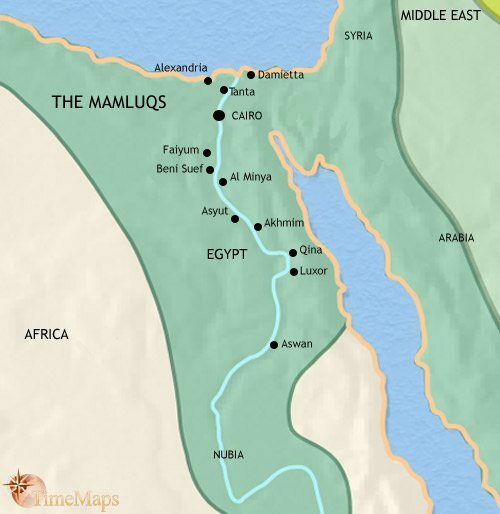 Although officially a part of the Ottoman empire, Egypt is really ruled by the Mamluqs. Egypt is now semi-independent from the Ottoman empire. 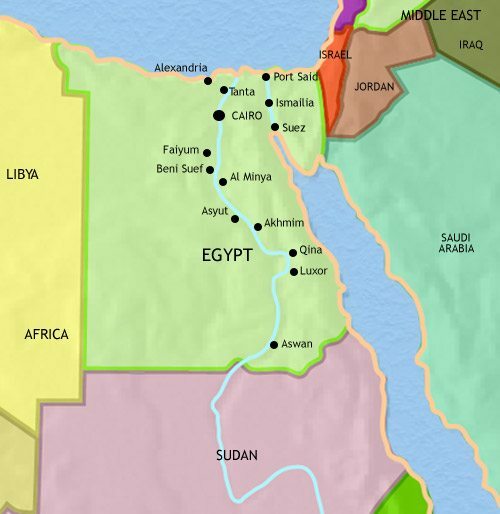 The Suez Canal has been opened. Egypt is now effectively a part of the British empire. Egypt is now ruled by President Nasser. Egypt is now ruled by President Mubarak. In the 870s the governor of Egypt, Ahmad Ibn Tulun, gained control of both Egypt and Syria and governed as an autonomous ruler, though he was careful not to openly break with the caliph. 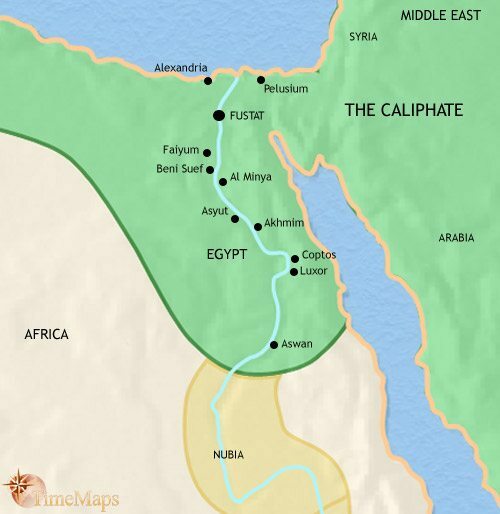 One of the caliph’s armies restored them to the caliph’s control in 905, but thirty years later Egypt again became autonomous under a rebellious governor, Muhammad ibn Tughj (935). 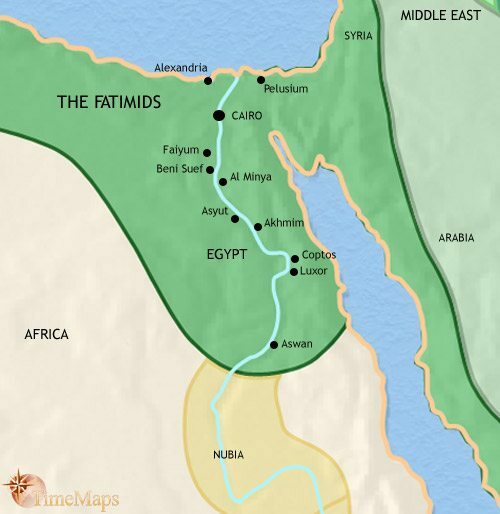 In 969 the Fatimids, a fervent Shi’ite sect, conquered Egypt. The Fatimids make no pretence of loyalty to the caliph in Baghdad, and their aim is, in fact, to displace them as the rulers of the entire Islamic world. As an independent state, Egypt’s tax revenues are now all spent within its own borders, rather than some or all of them being dispatched to some distant imperial capital such as Rome, Constantinople or Baghdad. This has allowed Egypt’s rulers to invest in Egypt’s agriculture, improve and maintain the irrigation system, increase the prosperity of the country and boost the government’s tax revenues. The process of Islamization (and Arabization) has been slowly gaining pace in Egypt. This has not been official policy: quite the reverse (non-Muslims paid higher taxes, so conversion was not encouraged by the government). However, the need by many people to deal with the new ruling elite has spread the knowledge of Arabic, and perhaps too the advantages which come from belonging to the ruler’s religious community, has encouraged many to convert. Nevertheless, the majority of Egyptians are still Christians at this date. One of the great civilizations of world history, Ancient Egypt, is beginning to emerge in North Africa. As a prelude to this development, powerful chiefdoms are emerging along the middle Nile valley. One of the main roles of these chiefdoms is to control the flood waters of the Nile, in order to irrigate the lands along the river banks effectively. Only thus can the fields be made fertile and the growing population of the Nile valley fed. This is key to the development of Ancient Egyptian civilization, as it requires the proper co-ordination of the work of thousands of people, in building canals, dykes and digging irrigation channels. The chiefs therefore exercise a high degree of control over the lives of their subjects. The chiefs are served by a hierarchy of officials and overseers, groups of people who are developing the skills – in record keeping, mathematics, engineering and management – which will over the coming centuries bring to fruition the magnificent achievements of the civilization of Ancient Egypt after it has become a unified country (c. 3000 BCE). While the civilization of Ancient Egypt is taking shape, another civilization has already emerged. By this date the Sumerians in Mesopotamia have developed the first true cities in history, and also the first proper writing system. The civilization of Ancient Egypt in 2500 BCE is now fully developed and producing some of the most iconic monuments in world history. Within the long, narrow valley of the river Nile, powerful chiefdoms fought and conquered each other in the centuries leading up to 3000 BCE, until one emerged to cover the entire land. Ancient Egypt in 2500 BCE belongs to the period known to modern scholars as the “Old Kingdom”. The kingdom is governed by a ruling class of officials and priests. This group directs the lives of the people in the name of the pharaohs, god-kings who rule from their capital, Memphis. Even by this early date the Egyptians have developed one of the great civilizations of the ancient world. The Great Pyramids of Giza, some of the most famous structures in all human history, have already been built, and sculptors are producing statues which will set the standard for Ancient Egyptian art for centuries to come. For Ancient Egypt in 1500 BCE, the past thousand years has seen periods of strength and unity, and of weakness and division. 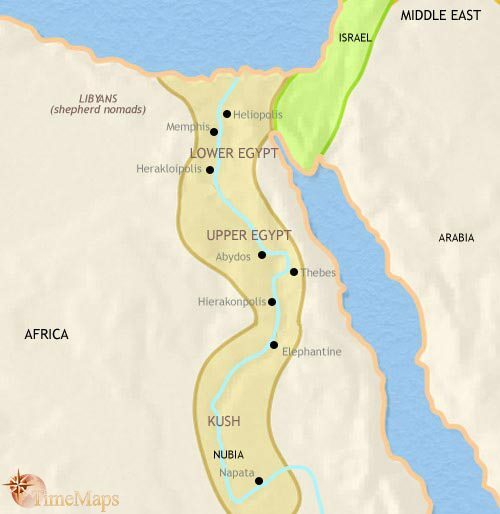 The Old Kingdom of Ancient Egypt came to an end in c. 2200 BCE, and the country dissolved into 150 years of anarchy during the “First Intermediate” period. Egypt was then reunited under the “Middle Kingdom”, which lasted from c. 2050 to 1700 BCE. 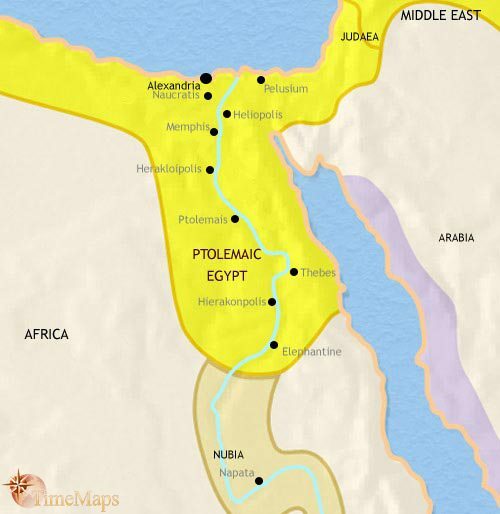 During this kingdom, the power that their rule over a united Egypt gave them enabled the pharaohs to project their power far to the south, in Nubia, and also into the land of Canaan in western Asia. The most recent period of disunity, the “Second Intermediate” period (1650-1550 BCE) has recently ended. A series of great pharaohs – including Hatshepsut, one of the few queens to rule Ancient Egypt in her own right – have reunited the country and founded the “New Kingdom” (16th to 11th centuries BCE). Having consolidate their power within the Nile Valley by creating the most highly centralised state system Ancient Egypt was ever to experience, these rulers have swiftly imposed their control over the surrounding peoples to south, east and west. This is the start of the most glorious phase of Ancient Egypt’s long history. For Ancient Egypt in 1000 BCE, the last five centuries has seen its civilization reach a peak of imperial power and cultural achievement, and then descend into another period of weakness and division. 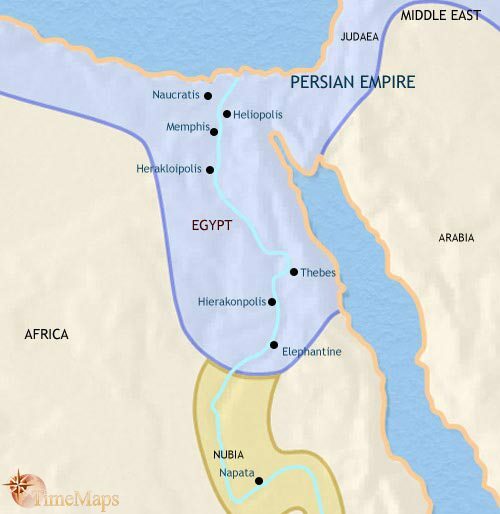 In the centuries after 1500 BCE, Egypt was one of the greatest powers of the day, with an empire stretching into Palestine and Syria in the north and Nubia in the south. At home, it witnessed the construction of the great temple complexes at Luxor and in the Valley of the Kings. It is during this period that the boy-king Tutankhamun briefly reigned, as well as Ancient Egypt’s most famous pharaoh, Ramesses II. Since about 1200 BCE, however, this most enduring civilization of the ancient world has been slipping into decline. 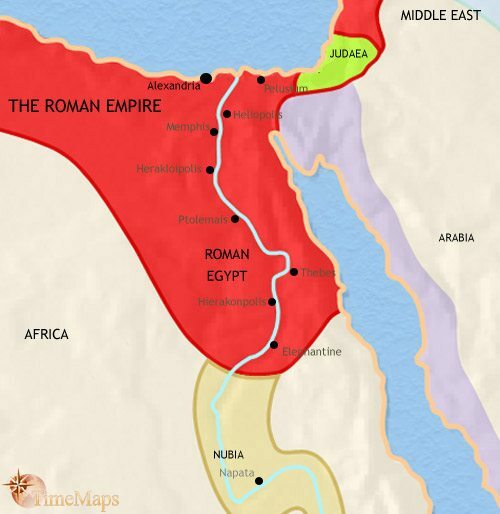 Egypt has lost her empire in Palestine and Nubia, has suffered invasions across all her borders, and has experienced political weakness at home. Ancient Egypt in 1000 BCE has the great days of its long-lasting civilization in the past. The great days of Ancient Egypt are now long past. Over the past few centuries Egypt has been invaded and occupied by several different peoples, most recently by the Persians, in 525 BCE. Egypt is now merely one amongst many provinces of the huge Persian empire. Nevertheless, Ancient Egyptian civilization remains very much alive. The temples to Egyptian gods and goddesses are still functioning, their priests more important within Egyptian society than ever; the art and architecture of Egypt remains very much within the ancient norms laid down thousands of years before; and the ancient Egyptian scripts are still in use by the scribes. After two centuries (off and on) as a province of the Persian empire, Egypt was conquered by Alexander the Great. After his death in 323 BCE, Egypt passed into the hands of his general, Ptolemy, and his descendants. 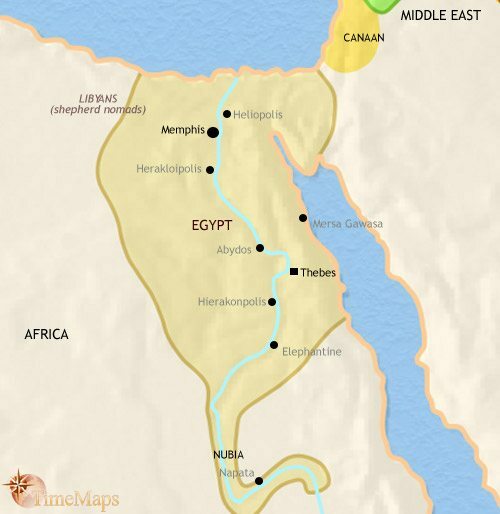 Under them, Egypt has become the wealthiest and most highly organized of the “Hellenistic” kingdoms. The Ptolemaic monarchs have adopted the traditional titles of the ancient pharaohs, and they worship Egyptian gods. Nevertheless the ruling class is largely of Greek origin. It has a Greek-speaking, Hellenistic culture, which has been grafted onto the traditional culture of Ancient Egypt to form a hybrid Greek-Egyptian civilization. On the coast, Alexandria is the largest and wealthiest city in the Greek-speaking world, and, with its magnificent library, is one of the leading centres of Hellenistic civilization. 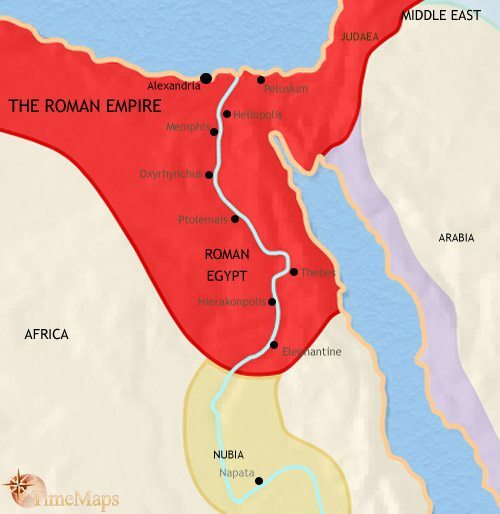 Like all the other Hellenistic kingdoms, Egypt has now been incorporated as a province into the Roman empire. The last independent ruler of Ancient Egypt was also her most celebrated – Queen Cleopatra. She ended her life committing suicide after her defeat at the battle of Actium (31 BCE). The victorious Roman ruler Octavian (since 27 BCE called Caesar Augustus) has kept the Hellenistic administration of the Ptolemies in place, highly effective as it is in extracting as much wealth as possible from the land and its people. The country now provides the distant imperial capital, Rome, with a large proportion of its grain. Egypt contains one of the largest and wealthiest cities of the Roman empire, Alexandria. It is a major commercial centre, and one of the great cultural centres of the Greek-speaking parts of the empire. The rest of the country is treated as a personal estate of the emperor, with the economy organized to extract as much produce as possible for export to Rome – Egypt continues to be the main source of grain for the imperial capital. Egypt is a vibrant centre of Christianity, with many monks living in tough conditions in the desert. It is here that the origin of Christian monasticism lie. Perhaps because of the economic hardships of the people, Egypt has become a centre for Christian groups that are at odds with the official Church centred on the capital of the Eastern Roman Empire, Constantinople. The Arabs’ conquest of Egypt from the Byzantines in 639 was made easier by the Egyptian population’s attachment to the monophysite branch of Christianity, regarded as a heresy by the Byzantine authorities in Constantinople, and therefore persecuted. The Arabs granted their conquered populations freedom of worship, and the Egyptians therefore welcomed them as liberators rather than conquerors. Egyptian society has thus far been little affected by the Arab conquests. For most of the population, it has been a case of swapping one alien ruler (in Constantinople) for another. The Arab presence was initially restricted to their new garrison town of Fustat, from which Egypt is now governed. 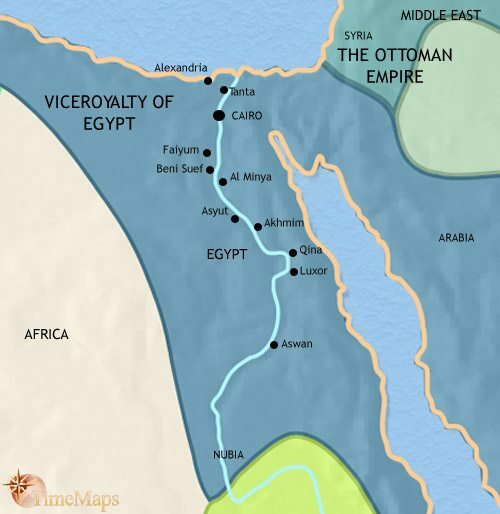 Although the Fatimids failed to achieve their goal of setting themselves up as the caliphs of the Islamic world, they did succeed in building up a large empire centered on Egypt. Under them, the Egyptian economy prospered. Trade expanded, as, with Fatimid control of the Red Sea, Egypt became once again the great entrepot of long-distance maritime trade between east and west. The Fatimid capital, Cairo, became the chief cultural centre of the Islamic world, with Muslim literature, philosophy and science thriving. Under Fatimid rule, thousands of Arabs settled in Egypt. At one point these posed such a serious threat to the regime that the Fatimids encouraged two of the largest Arab tribes to emigrate westwards into the Maghreb. Here they destabilize the emirate of Tunis. By the mid-12th century, Fatimid rule had weakened, and a Turkish general from Syrian, Saladin, was able to gain control of the country (c. 1170) and going on to annex parts of Arabia and Syria. With the capture of Jerusalem from the Crusaders (1187), most of Palestine also came under his rule. Saladin’s descendants, the Ayyubids, have indulged in frequent power-struggles, however, and this has allowed the Crusaders to hold on to their remaining possessions in the Levant. Saladin’s descendants surrounded themselves with a force of Turkish slaves, called Mamluqs. This force gained more and more power, until, taking advantage of yet another power-struggle within the royal family, they appointed one of their own members to the sultanate (1250). Ever since then Egypt and much of Syria has been ruled by Mamluq sultans, who have successfully defended and expanded their state and pulled the government of their different lands under one centralized administration. Perhaps their single most important achievement has been to defeat the Mongol army (1260) and so put an end to its hitherto unstoppable expansion. Under the Mamluqs, Egypt has continued to be the chief centre of Arabic civilization. However, recurrent plagues have reduced her population, and Timur’s conquest of Syria (1400) was a major blow to Mamluq power. Raiding by Bedouin tribes has also become a problem. 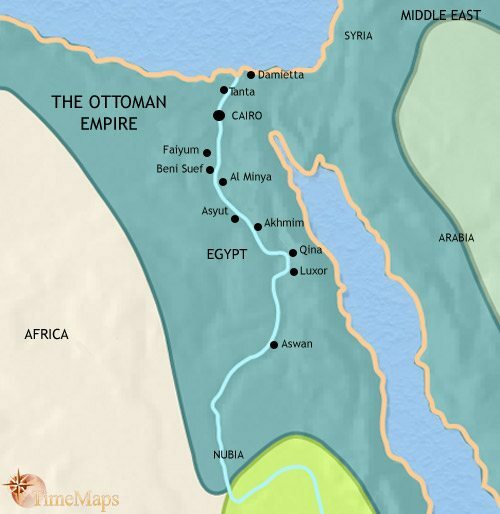 Egypt has, once again, become a province within a large empire, that of the Ottomans (1517). Again the Egyptian people have to pay taxes which are spent in a distant imperial capital. Their economic position has also been somewhat undermined by the rise of European sea power in the Indian Ocean, which has diverted some trade between India and Europe away from the Red Sea and Egypt. On conquering Egypt, the Ottomans left the Mamluq elite in a position of leadership within the country. Mamluqs troops were given an important role within the Ottoman army, and Mamluq officials were used by the Ottomans to help them govern Egypt. As time goes by the Mamluqs play an increasingly important part in the provincial administration, and by this date are on their way to re-establishing themselves as the dominant element within Egyptian society and government. By this time, the Mamluqs virtually rule Egypt again. Their leaders, or beys, continue to acknowledge the authority of the Ottoman sultan and his representatives, and to send tribute but, within the borders of Egypt, they reign supreme. The main factor preventing them from gaining even more power is their own internal instability, as the frequent power-struggles within their ranks prevent them from achieving a stable, united front against the Ottoman government in Constantinople. This part of the Ottoman dominions experienced direct European military might when Napoleon invaded it in 1798, utterly defeating local Mamluq forces at the Battle of the Pyramids. British sea power prevented him from receiving any reinforcements from France, thus bringing his campaign to a halt. Napoleon himself secretly left his army in Egypt in 1799, and a British army finally reconquered the country for the Ottomans in 1801. A Turkish general, Muhammed Ali, was sent to Egypt to restore order, and he was soon acting as a semi-independent ruler. He set about modernizing the country, but seeing that nothing could be done while the Mamluqs retained their power, he massacred them. He built hundreds of schools, modernized the administration, and introduced printing into the country (as a government monopoly). He raised a western-style army, recruited from the peasantry, and then set about conquering a huge empire in the Sudan. In 1821 he helped the sultan put down a rebellion in Greece. This confirmed his de facto independence from Constantinople, and in 1833 he demanded, and, due to British and French pressure, gained Syria from the sultan as payment for his part in the war of Greek independence. A little while later he started marching on Constantinople itself, with a view to replacing the Ottoman regime with one of his own. A Turkish general, Muhammad Ali, was sent to Egypt to restore order, and he was soon acting as a semi-independent ruler. He set about modernizing the country, but seeing that nothing could be done while the Mamluqs retained their power, he massacred them. He built hundreds of schools, modernized the administration, and introduced printing into the country (as a government monopoly). He raised a western-style army, recruited from the peasantry, and then set about conquering a huge empire in the Sudan. In 1821 he helped the sultan put down a rebellion in Greece. This confirmed his de facto independence from the Ottoman empire, and in 1833 he demanded, and, due to British and French pressure, gained Syria from the sultan as payment for his part in the war of Greek independence. A little while later he started marching on Constantinople itself, with a view to replacing the Ottoman regime with one of his own. Muhammad Ali was forced to withdraw from his move on Constantinople, and give up his claims to Syria, by military pressure from France and Britain (1841). Instead, he and his successors were recognized as the hereditary rulers of Egypt. Building on the modernization programme of his grandfather, Ismael (reigned 1863-79) has expanded Egypt’s frontiers further into the Sudan. One of the great engineering works of the 19th century was completed in 1869 with the opening of the Suez Canal. This was dug by French engineers and Egyptian labour over a ten-year period. It was a magnificent achievement. From now on the canal would be the prime route between Europe and the East, greatly shortening the time taken by ships to make the voyage. Although it was built with French initiative and engineering, the British government has ensured that it is the largest stock-holder. This has given it a huge economic stake in the political stability of Egypt. Ismael continued his expansionist policies in Africa until he met failure in his attempt to conquer Abyssinia (1875). Unfortunately, these military operations were expensive, as were his modernization programmes. The Egyptian government faced bankruptcy. This in turn threatened the stability of the country, and the security of the Suez Canal. Ismael’s European creditors (mainly British) stepped in, and a British official was appointed to take control of Egypt’s finances. A little later, a nationalist revolt against British interference threatened the Suez Canal’s security. The British sent forces to put down the revolt, and swiftly found themselves in control of the entire country (1882). From then on the British have administered Egypt, even though the country remains nominally subordinate to the Turkish sultan. In World War 2, Egypt acted as a major base for British operations against the Axis forces in North Africa. 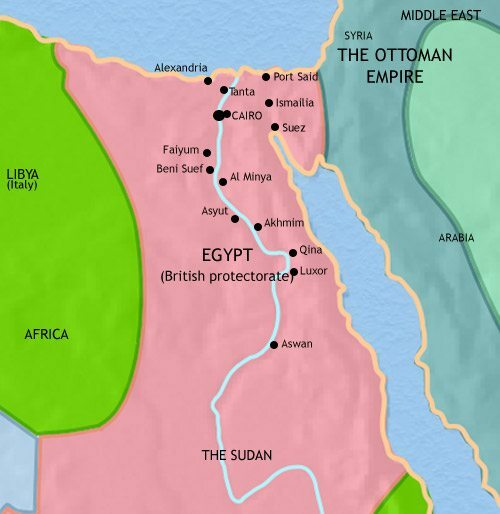 After the war, an upsurge in nationalism encouraged the British government to withdraw from Egypt in 1947, with the exception of the Suez Canal zone. The country was returned to the rule of its king, Farouk. He, however, was deposed in 1952 by a military coup, and the country became a republic under the leadership of colonel Gamal Abdel Nasser. The British finally left Egypt altogether in 1956, in the wake of the humiliating Suez Crisis. In this, British and French troops were sent in to guard the Canal Zone against Egypt’s threats to take it over; however, they were then forced to withdraw the troops in the face of international condemnation. 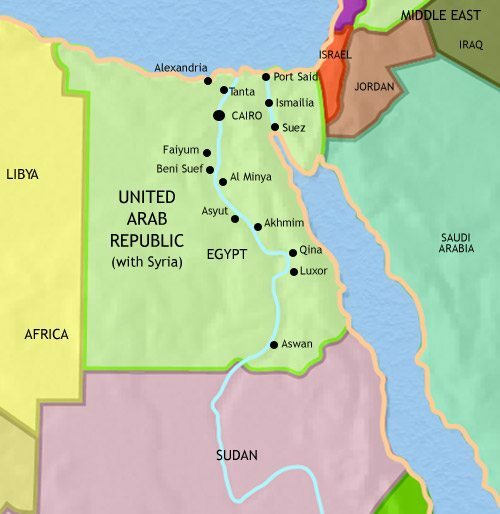 Since 1958, Egypt has been united with Syria in a state called the United Arab Republic. The United Arab Republic, that union between Egypt and Syria, was broken in 1961 (after three years), with the Syrians cancelling it unilaterally. Egypt, along with other Arab countries, was defeated by Israel in the 6 Days War with Israel (1967). The country continued to be ruled by the authoritarian President Nasser until his death in 1970, when Anwar Sadat became President. He is a moderate voice in Middle Eastern affairs and, after a second defeat by Israel in 1973, the Egyptian government promoted talks between the Arabs and Israelis. Sadat was assassinated in 1981; however, he was succeeded by Mohamed Mubarak, who continued Sadat’s moderating policies. Egypt has continued to be run as an authoritarian state, though recently there have been some signs of a move towards more openness and democracy.